except that we will print your logo and/or contact information prominently on the cover. 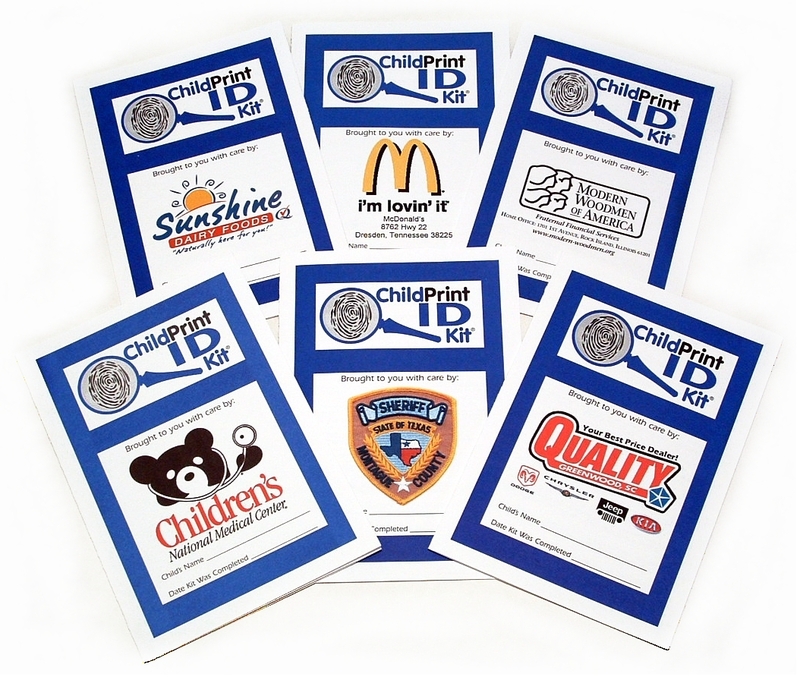 Custom kits are ideal goodwill giveaways for child safety promotions, community events, and grand openings. Parents greatly appreciate receiving a product that helps to protect their children by teaching safety strategies, and recording vital data. sponsorship or advertising piece that permanently remains in the family home, and has lasting value. and all professionally printed to their exact specifications. Many of our clients contact us each year to distribute kits to their communities. Customizing is easy and inexpensive! Your logo can be printed alone, or with up to five lines of text, depending on the layout. You can also have up to three logos printed at no extra cost, if you are working with other sponsors. The space for the logo and/or text is 3" x 3"
The optimal amount of text we recommend includes your phone number, physical address, and website, so that the space is uncluttered. However, we will print any text, provided it fits within the printable area. We provide you with a free proof to review before any printing is done, and one free revision, if necessary. The proof is usually emailed within two hours after you submit your artwork. Additional proofs (beyond two) are $25 each. We accept .EPS, .JPG, .PDF, and .TIF files (no .BMP or .GIF files, please), preferably at least 300 dpi, and larger than 3" square. Please make sure your artwork is clear and sharp. If you email us a low-resolution graphic, it will print fuzzy and the colors may not be accurate. There are no artwork, typesetting, or setup fees! The minimum order quantity is 100 kits, and full color logo kits begin at only $1.25 each. There are no fees other than the price per kit and the shipping. Please see below for complete Custom kit pricing. To order, please call 1-888-972-7232 to speak with a product specialist. Note: If there is a quantity you need that is not listed, please call us. We can ship any amount. 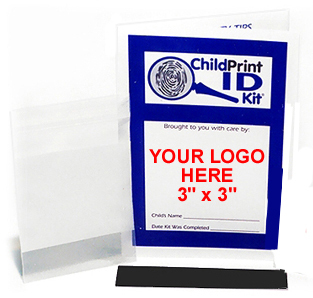 To order Custom ChildPrint ID Kits, please call 1-888-972-7232, to speak with a product specialist.